In this article, we will look into the internal workings of LinkedHashMap. LinkedHashMap is a HashMap that also defines the iteration ordering using an additional data structure, a double linked list. By default, the iteration order is same as insertion-order. It can also be the order in which its entries were last accessed so it can be easily extended to build LRU cache. The data structure of LinkedHashMap extends that of HashMap. In HashMap, the data structure is based on array and linked list. An entry finds its location in the array based on its hash value. If an array element is already occupied, the new entry replaces the old entry and the old entry is linked to the new one. In HashMap, there is no control on the iteration order. In LinkedHashMap, the iteration order is defined, either by the insertion order or access order. LinkedHashMap differs from HashMap in that it maintains a doubly-linked list running through all of its entries. The below one is a modified example of the above data structure. It defines the iteration ordering based on the order in which keys were inserted into the map. In order to do so, the entry element is extended to keep track of the after and before element. A zero size LinkedHashMap contains just the Head element with before and after pointing to itself. LinkedHashMap's Entry extends the HashMap's Entry so it also inherits the same properties key, value, hash and the next Entry sharing the index. Other than these, it also has couple of additional properties to maintain the double-linked list, after and before entries. LinkedHashMap inherits HashMap so its internal data structure is same as that of HashMap. Apart from that it also maintains a double-linked list which is circularly linked via the sentinel node called head. Each node contains references to the previous and to the next node . A new node is always added to the end of the list. In order to do so, the last node’s and the header node’s links have to be adjusted. The new node’s next reference will point to the head. The new node’s previous reference will point to the current last node. The current last node’s next reference will point to the new node instead of head. Head’s previous reference will point to the new node. Performance is likely to be just slightly below that of HashMap, due to the added expense of maintaining the linked list. A special LinkedHashMap(capacity, loadFactor, accessOrderBoolean) constructor is provided to create a linked hash map whose order of iteration is the order in which its entries were last accessed, from least-recently accessed to most-recently. Invoking the put or get method results in an access to the corresponding entry. If the enclosing Map is access-ordered, it moves the entry to the end of the list; otherwise, it does nothing. Thus in access-ordered linked hash maps, merely querying the map with get is a structural modification. In HashMap, the iterator has to traverse through each table element and the element’s own linked list, requiring time proportional to its capacity. In LinkedHashMap, it simply has to traverse through its own double-linked list thus requires time proportional to the size of the map and not its capacity so HashMap iteration is likely to be more expensive. Re-sizing is supposed to be faster as it iterates through its double-linked list to transfer the contents into a new table array. containsValue() is Overridden to take advantage of the faster iterator. The eldest entry is returned by header.after. The default implementation of removeEldestEntry() returns false. The main reason why one prefers LinkedHashMap over HashMap is that it can retain the order in which the elements are accessed. 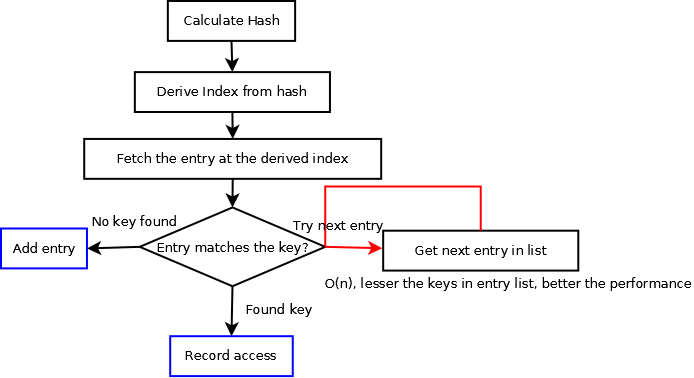 Below is the basic flow that a HashMap goes through to put a new entry. The blue boxes, ‘Add Entry’ and ‘Record Access’ are the ones LinkedHashMap overrides. It overrides ‘Record Access’ to record the access order. If the user is interested in the access order, it updates its double linked list. Below entry picture shows how the entry moves up the linked list. Head’s next entry will point to the latest entry accessed. If E2 is accessed again, HashMap identifies the entry and then calls record access. The record access is overridden in LinkedHashMap. 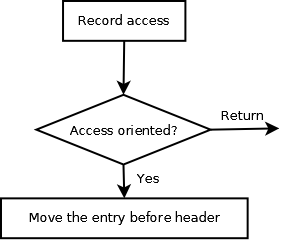 Below is the class diagram where LinkedHashMap extends HashMap’s entry to override the recordAccess. Suppose we want to remove an entry E2. In case of double linked list, the previous pointer in E2 will take us to E3 in O(1).